THE FORMER BRITISH Foreign Secretary is warning of a car-crash style Brexit, if the so-called ‘Irish backstop’ is enforced. The Irish backstop is a monstrosity that wipes out our sovereignty. With the deadline for Brexit looming (the UK is set to leave the European Union on 29 March next, a mere six months away), the Irish border issue remains highly contentious. Johnson’s latest comments come as the BBC is set to air an interview with Theresa May tonight, in which she urges her cabinet colleagues to stick to the Chequers plan agreed in July. The plan envisages a deal which would see common trade rules and the UK remaining close – but separate from – the EU. It also adheres to an agreement on the Irish border, known as the ‘Irish backstop’, which would see Northern Ireland remain in the EU if Brussels decides it’s not happy with the final exit arrangements. In this latest interview with the BBC, Theresa May said there’s only one deal on the table that will avoid a hard border between the Republic of Ireland and Northern Ireland, her Chequers plan. 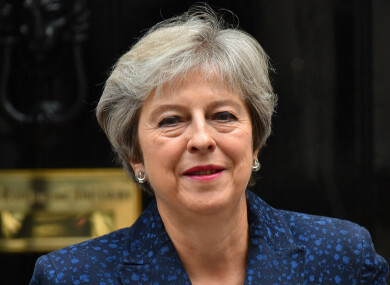 The British Prime Minister said her government needs to ensure that the break from the European Union does not lead to the breakup of the UK. They don’t want a hard border between Northern Ireland and Ireland. The only proposal that’s been put forward that delivers on them not having a hard border and ensures that we don’t carve up the United Kingdom is the Chequers plan. Theresa May says she's "irritated" by ongoing speculation about her position as PM. “To understand the origin of the disaster, you need to go back a few hundred paces to a fatal patch of oil on the road. It is called the Irish backstop,” Johnson writes. 28.07.18 A Brexit timeline: How much time is actually left to strike a deal? In that sense the protocol would amount to a change in Northern Ireland’s constitutional status without its people’s consent – a total breach of the peace settlement. As the British government enters the countdown phase of negotiations, May and the Irish government insist friction-free trade must remain between the two nations. In this latest offensive, she says she’s working to ensure the people of Northern Ireland are not forgotten as her government works to agree on what a Brexit will look like. The people of Northern Ireland deserve to be listened to in these negotiations by the UK government as people elsewhere in this country,” she said. The programme will air tonight on BBC One at 8.30pm. Email “Irish backstop a 'monstrosity' warns Johnson as May insists Northern Ireland must not be forgotten”. Feedback on “Irish backstop a 'monstrosity' warns Johnson as May insists Northern Ireland must not be forgotten”.